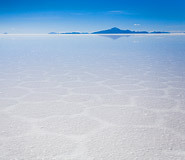 Discover Uyuni during your price guaranteed Bolivia vacation. All of our Bolivia tours have daily departures and are fully customizable. Uyuni is in many ways a bizarre and surreal place. Hot in the sun, cold in the shade, and freezing at night, the small Bolivian town could be described as climatically challenged. This isolated settlement was founded in 1889 to enable the exploitation of mineral riches hidden in the earth. In the present, the small population of just 21,000 residents is primarily employed by the government and mining companies, most of which are exclusively involved in salt extraction on the Salar de Uyuni. Every year, thousands of ordinary travelers are also drawn to the dazzling natural wonder that is Uyuni. The salt lake is simply enormous, and standing in the middle of it, surrounded by a vast white space, is exhilarating, inspiring, and humbling. The Uyuni Salt Flat covers 4,086 square miles (10,582 square kilometers), and the elevation varies by less than 1 meter over the whole, resulting in an incredible flatness that allows for fantastic optical effects with a camera. 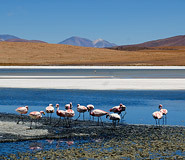 The surrounding highlands are yet another draw; these include the nearby Eduardo Avaroa Andean Fauna National Reserve, home to various species of pink flamingos and other interesting creatures. A tour to Uyuni, a unique place on Earth, is like no other Bolivia excursion and truly a trip of a lifetime. Rainy season or dry, the surreal treasures of Uyuni boggle and delight the mind. Stroll around town. The main thing you want to do in Uyuni is bundle up, because the sweeping winds can be bone chilling. Before heading out into the salt flats, there are a few places worth visiting in town, which was formerly a major railway junction and still serves as a distribution hub. The Cementerio de Trenes (Train Cemetery) is an odd collection of rusting rail cars worth a gander, and about 30 minutes from town is Pulacayo, a tiny town where you can see Bolivia’s first train as well as the locomotive robbed by the infamous Butch Cassidy and the Sundance Kid. An hour or so can also be spent at the Museo Arqueológico y Antropológico de los Andes Meridionales, a small museum with collections of local fossils, ceramics, and mummies. Uyuni Salt Flats Tour. The real reason people come to Uyuni is to leave again to go to the Salar. It is a surreal sensation to stand in the middle of a vast expanse and to stare into the distance, unable to tell exactly where the land ends and the sky begins. 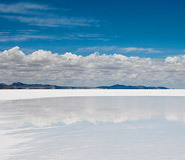 This is the largest salt flat in the world, and definitely not to be missed. A 3-day tour continues into the surrounding highlands, an area of intense volcanic and geothermal activity, dotted with brilliant lagoons colored red, green, and white by microscopic algae and populated by pink flamingos. Strange rock formations are scattered throughout, including Incahuasi Island, a rocky outcrop of coral reef covered in groves of giant cacti and believed to be the remnants of a volcano that existed in the middle of a giant prehistoric lake. The best time to visit Uyuni is in June and July, when the bright blue sky contrasts nicely with the blazing white ground. Note however that this is winter time, and even daytime temperatures can be icy. The dry season lasts from March until November. Rainy season is December until March. Even though the Salar tends to become flooded and travel can be more difficult and slow-going, the rainy season is still a popular time for Uyuni tours. The principal reason why travelers flock here at this time is because the rainwater pools on the surface and transforms the salt lake into a giant mirror that reflects the heavens – the long distances to the next geographical marker seem infinite and the optical effects that can be produced with a camera are a photographer’s dream. Accommodations in Uyuni are rather basic. The best options are two 3-star hostels; other options are pretty basic, with no heating. Contact your travel advisor for more information.